I couldn’t see the bird, so I was hooked on. Every time I went there I would hear it and I would try in vain to discover the source. 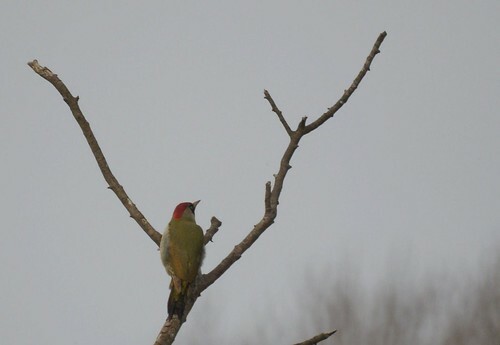 It took me a while before I finally discovered a Green Woodpecker flying and crying at the same time! The sound has often been called a laugh and everytime I heard it, I thought it was a mocking laugh aimed at me for not getting a picture of it! The laugh is also referred to as a Yaffle and the Bird is also called a Rainbird. 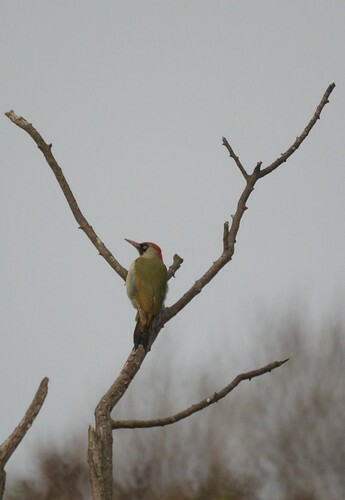 The Green Woodpecker is not only Britain`s largest Woodpecker, but is can also claim to be one of its more colourful species. 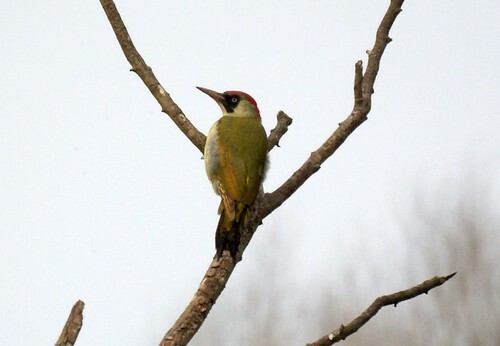 Both sexes are alike, except for the lower black streak below the lower beak, which has a crimson or red centre in the male. So the bird pictured in this post is obviously a female. The bird has been known to have a fondness for ants. 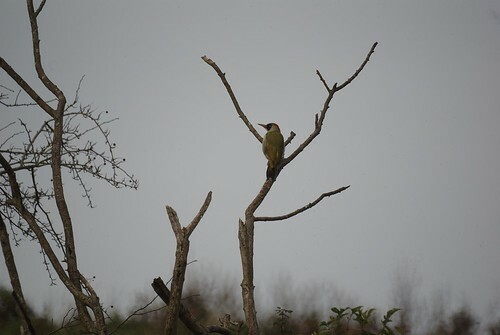 The most common habitats where this bird is found is in the open deciduous woodland, parks, orchards and farmland. It prefers old timbered parks, and open country where there are ancient trees rather than dense woodlands. It captures insects from tree trunks or from the ground with a rapid flick of its tongue, which is sticky with gummy saliva. 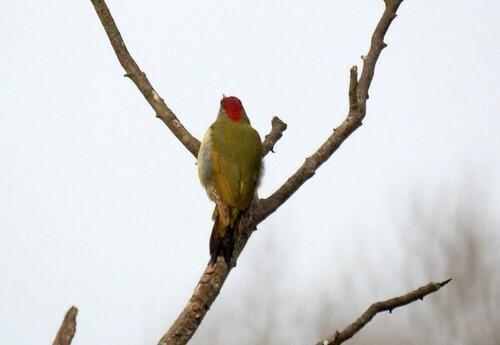 The Green woodpecker nests in holes in trees like other woodpeckers. The bird is currently on the amber status with regards to its conservation status. A great series of photos and I liked the audio file. Its so much easier to understand about the bird with both descriptions. Great pics of one of my favorite bird families. And the audio file was a nice added touch! Well done! Great pictures of a beautiful bird. I'm glad you were finally able to put the sound with a bird. Very rewarding! 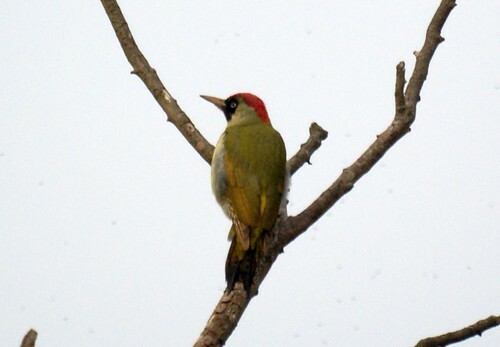 That's a cool looking woodpecker. I havn't seen one quite like it before. The audio file is a hit. Terrific post with so many good photos and the call as well. Good info as well. Beautiful pictures series. 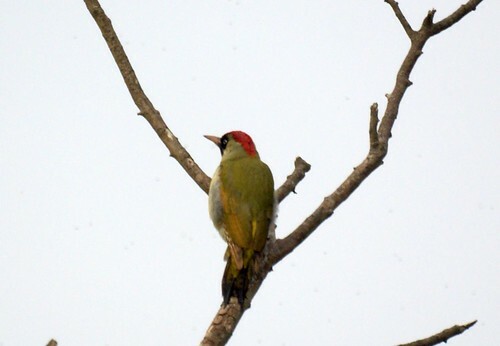 Woodpeckers are very vocal and beautiful colours. Our Common Flameback is a golden coloured at the back. 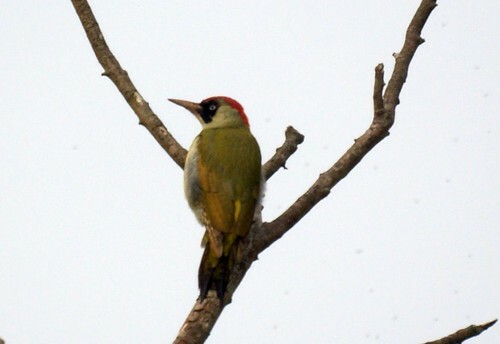 What a striking bird, with its yellow eye in the middle of that dark face patch and the red on his head. Enjoyed your photos and I do love the embedded call clip. Glad to find you from Bird Photography Weekly.